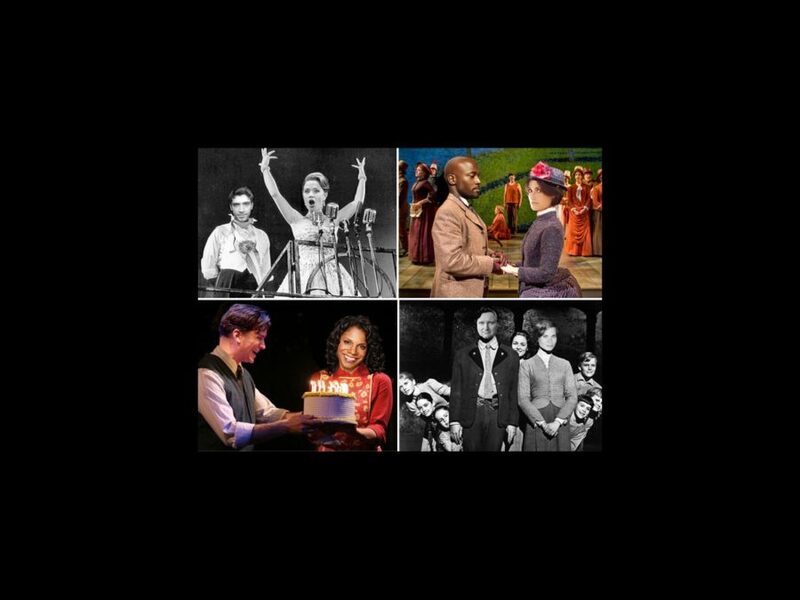 To celebrate Valentine’s Day, we dream-cast 15 of our favorite real-life couples in musicals we’d like to see them do together. From Sierra Boggess and Tam Mutu in Evita to Idina Menzel and Taye Diggs in Sunday in the Park with George, our list of stage pairings would be an endless treat for Broadway lovers! Read on, and see if you agree. Husband and wife Sebastian Arcelus and Stephanie J. Block would bring fiery passion to the warring couple at the center of this classic backstage musical. (Block already played a star diva in By the Way, Meet Vera Stark.) Also, they would get a chance to sing their faces off. Too darn hot indeed. The mission "doll" in this classic musical does not have to be boring. Imagine the chemistry between Tony winner Laura Benanti and her dashing hubby Steven Pasquale as Sarah Brown and Sky Masterson, especially in the Havana scenes. Ding Dong Ding Dong DING! Smash star Jeremy Jordan has expressed interest in co-starring in Urinetown with his wife, Ashley Spencer. While we love that idea, we’d prefer to see them as Rocky Horror’s naive and nearly naked couple Brad and Janet. We see you shiver in an-ti-ci…pation. A Broadway revival of this enchanting musical is way overdue, and we can picture spouses Ben Walker and Mamie Gummer as Georg and Amalia, who bicker at work but fall in love as pen pals. If Gummer has the voice to deliver "Dear Friend" and "Vanilla Ice Cream," this revival could be a smash hit. Take a deep breath and get high off the idea of The Book of Mormon’s Matt Doyle and his boyfriend, Matilda’s Ryan Steele, as Berger and Claude, the central hippies in Hair. These two can bring some closure to the age-old question: are Berger and Claude friends, lovers or was it just the '60s? Skid Row would get a whole lot funnier in the hands of comic standout Jessica Stone and her Tony-nominated husband, Christopher Fitzgerald. This quirky couple could unearth a new layer of laughs (while nailing the melancholy subtext) as Audrey and Seymour in Little Shop of Horrors. It would take a heck of a lot to lure Glee star Lea Michele back to Broadway, but stepping into the Tony-winning musical Once with her real-life beau Corey Monteith by her side might do the trick. Lea, “when your mind’s made up” to come back to Broadway, look no further than Once. It’s a shame that brilliant Sondheim performers Marin Mazzie and Jason Danieley have not taken on the master in the same show yet. We’d like to see this married pair play Night Music’s complicated couple Desiree Armfeldt and Fredrik Egerman now, soon or later. Who better than Orfeh and Andy Karl to play a tough, big-voiced broad and the debonair sharp-shooter who tames her? The only hitch: finding a theater big enough to contain the power of this pistol packin' mama and her man (with a gun). We’d love to hear Idina Menzel and Taye Diggs wrap their voices around Sondheim’s beautiful Sunday in the Park score. The complex and heartbreaking story would be a walk in the park for these two Rent vets—and we'd especially love to see Idina at Dot's dressing table! Broadway is in desperate need of a Falsettos revival, and who better to play the major roles of Marvin and his lover Whizzer than How I Met Your Mother star Neil Patrick Harris and his B'way hubby David Burtka. What more can we say? Sarah Jessica Parker & Matthew Broderick in Hello, Dolly! Let’s see Sarah Jessica trade her designer shoes for some oversized hats! Parker would be looking swell as meddling matchmaker Dolly Levi, and her Tony-winning husband, Matthew Broderick, would bring his dry wit to the ornery half-a-millionaire Horace Vandergelder. Stand back! As Eva and Juan Peron, the unbelievably talented engaged couple Sierra Boggess and Tam Mutu would not only rule Buenos Aires, they’d rule Broadway. At last, the new Argentina we’ve been waiting for. Recently married Broadway stars Audra McDonald and Will Swenson would be electric as bipolar mom Diana and her supportive husband Dan in Next to Normal. With these two telling the heartbreaking story and belting center stage, you know "it’s gonna be good."